The Venezuelan Op-Art and Kinetic artist, J.R. Soto began his kinetic art career in the mid 1950s by making works incorporating plexiglass superimpositions on perspex. 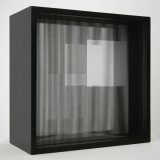 The optical effect that resulted was created by the relationship between the surfaces, and the works played with the viewer's perception - they have been described as 'disconcerting and fascinating as a mirage'. Soto's works were exhibited in museums including the Museum of Modern Art and the Guggenheim Museum in New York, and the Centre Georges Pompidou in Paris. In 1973, the Soto Museum of Modern Art opened in Venezuela with a collection of his work.